Based in Denair, California, Rose Marie and Ward Burroughs have been Organic Valley dairy farmers since 2005. Here, Rose Marie, whose parents are from New Mexico, shares her mother’s recipe for New Mexico enchiladas—but with a twist or two. Like many family foods that get passed down through the generations, the dish retained its authentic essence yet changed with the times. 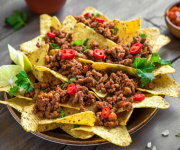 To soften the corn tortillas, for example, Rose Marie’s mother used to quick-fry them in traditional lard, but she began substituting corn oil in the 1970’s, when lard became viewed as unhealthy. “But I didn’t like using all that corn oil—there are issues about corn oil, too&mdah;so I thought of coconut oil,” says Rose Marie. She also switched from a customary flour-and-fat-based roux to arrowroot, for thickening the chile sauce. 1. Prepare the chile sauce: Remove stems and seeds from dried chiles (wear gloves while doing this and/or take special care not to rub your eyes with fingers that have touched the chiles). Rinse chile skins then combine them in a saucepan with enough water to cover them. Bring to a boil, then turn off heat and let chiles soak 15 minutes (you can place plate over chiles to keep them submerged). Drain. Combine chiles, salt, garlic, arrowroot, and 4 cups water in a blender or food processor. Blend until mixture is a smooth puree. Place puree in a 9-inch (medium-sized) cast iron pan; bring to a boil over medium heat, then lower flame and simmer 20 minutes, stirring occasionally. 2. 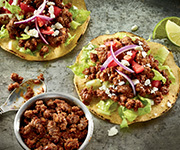 While chile sauce is simmering, prepare the enchilada fillings and garnishes: Prepare onions, cheese, lettuce, and tomatoes as described above. Set aside in separate bowls. Heat a large, heavy skillet over medium-high flame. Add the ground beef and brown it, stirring occasionally and crumbling it. Drain off excess fat. Add garlic salt to taste. Keep meat warm. Note: Rose Marie Burroughs says that the “key ingredient in this recipe is the right kind of dried chile pod.” She’s referring to the dried red New Mexico chile, an elongated pod that ranges in heat from mild to hot, and in size is typically about five to seven inches long, and about an inch and a half wide across the stem end. Bright red when fresh and ripe, and a burnished mahogany when dried, they are a regional icon, often used in the decorative stringed chile bundles known as ristras. Look for the larger ones for this recipe and even if you find ones labeled “mild,” take care when handling and cooking them, for the flesh can bother sensitive skin, and the steam that rises when cooking them can sting one’s eyes and throat.